Summary from Goodreads: Finn has escaped from the terrible living Prison of Incarceron, but its memory torments him, because his brother Keiro is still inside. Outside, Claudia insists he must be king, but Finn doubts even his own identity. Is he the lost prince Giles? Or are his memories no more than another construct of his imprisonment? And can you be free if your friends are still captive? Can you be free if your world is frozen in time? Can you be free if you don't even know who you are? Inside Incarceron, has the crazy sorcerer Rix really found the Glove of Sapphique, the only man the Prison ever loved. Sapphique, whose image fires Incarceron with the desire to escape its own nature. If Keiro steals the glove, will he bring destruction to the world? Inside. Outside. All seeking freedom. Like Sapphique. 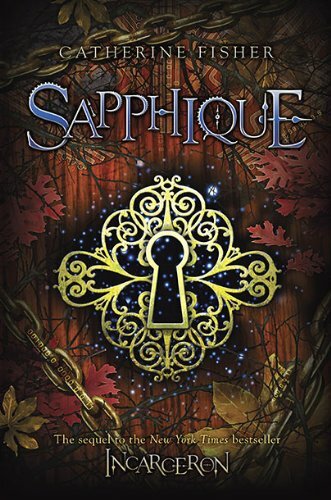 Sapphique is the sequel to Incarceron, a book that I absolutely loved. 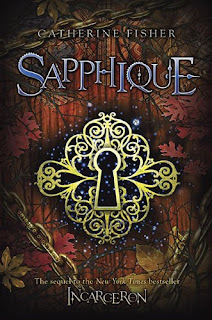 So, I am very excited for Sapphique to be published in the United States. Just like Incarceron, it was published in the UK first. And the cover is amazing. Incarceron's cover was gray with a blue key as the focal point. Sapphique has a keyhole through which we can see a sky full of stars, in the middle of what looks like a door, maybe. I know that I could buy the UK edition of Sapphique from The Book Depository or Amazon UK, but I just need to have a matched set. Sounds like a tempting read! Wow, what a gorgeous cover! Hope you enjoy it when it comes out. Have a great week and happy reading. Argh, I think I finally need to just read Incarceron! (I did this with The Hunger Games too...waiting for no good reason!) I had no idea there was a sequel coming out, so thanks for the heads-up! My WoW pick is here. I waaaaaaaaant. I loooove the cover. Love, love, love. But I haven't even read Incarceron yet. :( Ugh. Great pick! Mine is at The Crowded Leaf. Ooooh both the UK and US covers for this duology look awesome and I've heard such good things about it. I'm looking forward to reading both Incarceron and Sapphique! I prefer the US covers of this series. I just got Incarceron in the mail yesterday and I'm excited to read it soon (I didn't read the blurb for this book so the first book wouldn't be spoiled). I have heard so many good things about this series. Great WoW pick! Goodness, that is a beautiful cover. I still have yet to read Incarceron, and I bought it weeks ago! Can't wait to start this series. Nice pick! This one looks so good! I need to read the first one! I've got an award for you at The Crowded Leaf. New Blog Layout and a Contest! !